Sitting near a private home, Lock 48 near McDermott nevertheless is owned by the Ohio Department of Transportation and sits in a park-like setting, complete with a small parking lot. Bill Tipton points out some of the features of Lock 50 in West Portsmouth. 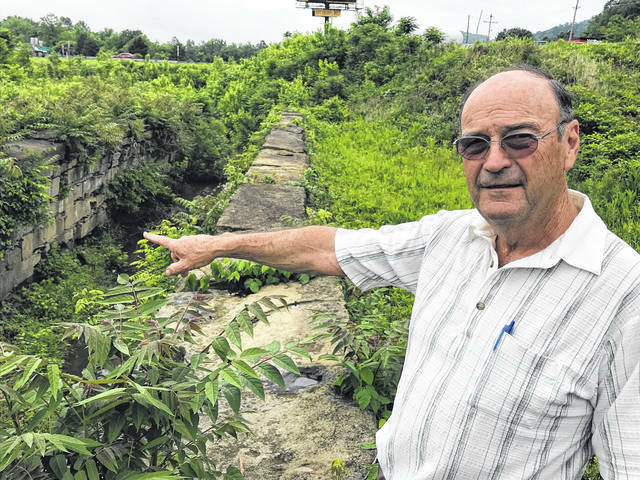 “Scioto County just doesn’t seem to have a good sense of history,” opines Bill Tipton of Scenic Scioto Heritage Trail, Inc.
Tipton and his cohorts are trying to do what they can to change that situation. The Portsmouth area is home to four remaining locks from the Ohio Erie Canal, which, of course, started on the shores of Lake Erie in the Cleveland area, but ultimately ended 309 miles south on the shore of the Ohio River in Portsmouth. Tipton isn’t sure how many locks were part of the canal, which the railroads had put out of business by 1913. He can say for sure the last lock, Lock 55, sits to the side of the Carl Perkins Bridge. Not incidentally, the locks were not numbered in sequential order and there were more than 55 in total, according to Tipton. Beginning early this spring, the Scioto Heritage group launched an effort to have the remaining locks added to the National Register of Historic Places. The group is also working with Groveport and the villages of Lockbourne and Baltimore along with public and private groups in Pickaway County to have a total of nine locks added to the national register. Obviously, though, Tipton and his group seem most interested in the locks in Scioto County. Now largely resembling a drainage ditch overgrown with vegetation, the canal basically follows state Route 104 through Scioto County. Lock 48 is near Rush Town and is essentially the highlight of a small park maintained by the Heritage group (along with a private Portsmouth charity that helps developmentally challenged persons), and features a small bridge running across the canal. That park is clearly marked and open to the public. Lock 49 is privately owned and, believe it or not, was used as a foundation for an existing home. Lock 50 sits adjacent to the Union Mills Confectionery in the unincorporated area of West Portsmouth. Although, the lock is currently somewhat overgrown with vegetation, Tipton says for many years it was maintained and kept in tact by the original founder of the confectionery, Rev. Robert Temple. Temple has moved from Portsmouth, though his family still runs the business he started. 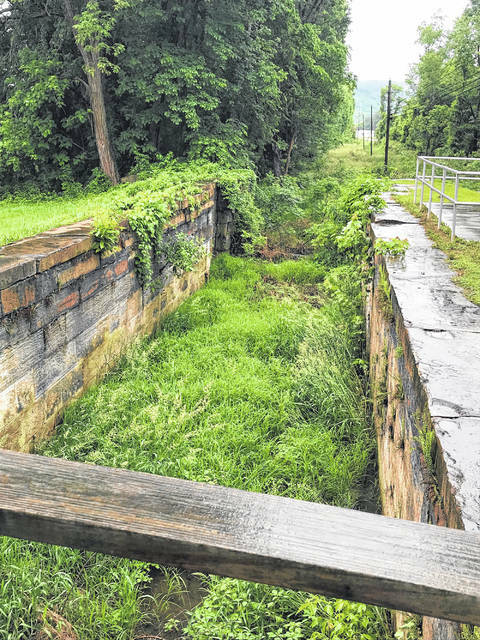 “By getting our canal locks listed, it will give them protection and also give us the ability to apply for grant money to maintain and improve them,” Tipton wrote in some notes he provided regarding the Heritage group’s project. Tipton further noted the group’s efforts are being coordinated with the Ohio and Erie Canal Way Coalition. “The long-term goal of the coalition is to have a statewide canal byway. This would once again have people ending their journey in Portsmouth, just one more thing to bring tourists to our area,” Tipton continued. Overall Tipton says Lock 55 is in very good condition, but it cannot be considered for inclusion on the national registry at this time. The reason is the heavy rains that struck the area in late winter and early spring have left Lock 55 underwater, and, therefore, it could not be viewed when a group from the national register visited early this spring. “It will have to be a project for next year,” Tipton concedes. In addition to working on the lock project, the Heritage group just completed a new driving map meant to guide visitors and residents alike around Scioto County’s portion of the canal byway and points of interest along it. They are also developing a DVD about the byway. “We still have spots for local businesses who would like to advertise on the DVD,” Tipton notes. – The canal originally ended at the Scioto River. Tipton said the level of the Scioto was so variable, it became a problem for boats using the canal. The terminus of the canal ultimately was moved to the Ohio River. – The canal was constructed in the 1820s and ’30s. At one time there were 4,000 people working on building the canal. At least one Portsmouth area church was built specifically to meet the needs of canal workers. – The canal played an important part in the history of the Underground Railroad. In at least one instance, some 400 freed slaves made their way to Cincinnati and then used the Miami and Erie Canals to reach Mercer County where they had land waiting for them. Tipton says the canal project has not been a cheap one for the Heritage group, costing them roughly $5,000 so far. They are accepting donations. For more information, visit the group’s website at www.sciotoheritagetrail.com. https://www.portsmouth-dailytimes.com/wp-content/uploads/sites/28/2018/05/web1_lock48a.jpgSitting near a private home, Lock 48 near McDermott nevertheless is owned by the Ohio Department of Transportation and sits in a park-like setting, complete with a small parking lot. https://www.portsmouth-dailytimes.com/wp-content/uploads/sites/28/2018/05/web1_Tiptona.jpgBill Tipton points out some of the features of Lock 50 in West Portsmouth.